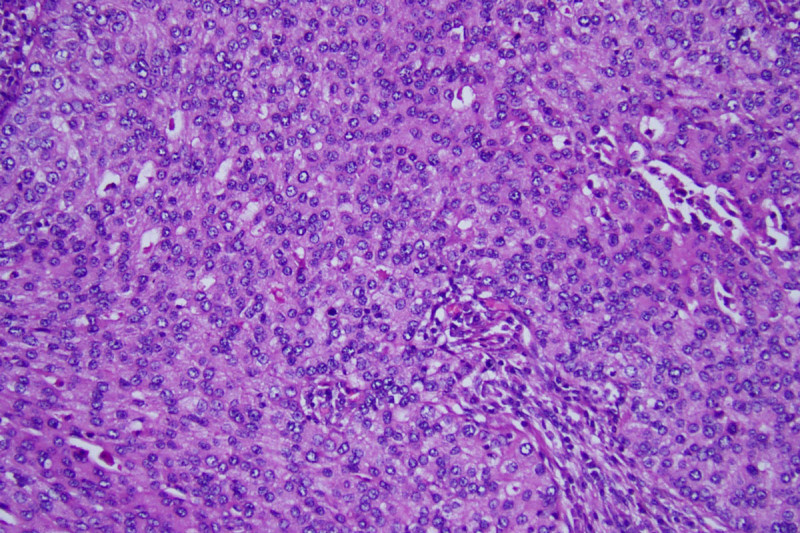 This cell pattern, known as solid predominant subtype, is an aggressive form of lung adenocarcinoma that has a high risk of returning after surgery in multiple locations. Doctors are now able to identify whether patients with early-stage lung adenocarcinoma have an aggressive form called solid predominant subtype. Following surgery, this type of lung adenocarcinoma often returns within two years in multiple locations, even when tumors are small. These patients may require closer follow-up and adjuvant treatments in addition to surgery in order to reduce risk of recurrence. Patients with early-stage lung adenocarcinoma traditionally had surgery alone. An aggressive subtype often returns after surgery even when tumors are small. Surgeons and oncologists are now able to identify this subtype. This form of lung adenocarcinoma is called solid predominant subtype. These patients may require closer follow-up and additional treatments. Patients with early-stage lung adenocarcinoma, the most common form of lung cancer in the United States, typically have their tumors surgically removed without additional treatment. This has been the standard therapy for stage I patients whose tumors are small and have not spread to nearby lymph nodes. 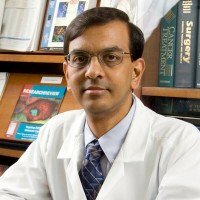 Now research led by Memorial Sloan Kettering thoracic surgeon and scientist Prasad Adusumilli has identified a subset of these patients whose cancer is more likely to return soon after removal, often appearing in multiple locations and ultimately proving more lethal. These patients have a form of lung adenocarcinoma called solid predominant subtype. We can now identify aggressive tumors among early-stage lung cancers. Until now, surgery was thought to be sufficient for treating patients with tumors less than 5 centimeters in diameter. The new study, published in the Journal of Clinical Oncology, shows that some of these tiny tumors — even those smaller than 2 centimeters — come roaring back soon afterward. This finding could change the course of treatment for a significant number of patients with lung adenocarcinoma, a form of non-small cell lung cancer. Although currently only about 20 percent of patients are diagnosed before the cancer has spread to other parts of the body, this portion is expected to increase as more people undergo low-dose CT scans to screen for the disease. Medicare recently approved coverage of these scans for people who are at high risk for lung cancer due to smoking. There has been a growing appreciation that the multiple subtypes of lung adenocarcinoma behave differently. As a result of tumor data from MSK and other cancer centers, the International Association for the Study of Lung Cancer (IASLC), the American Thoracic Society (ATS), and the European Respiratory Society (ERS) jointly issued a new tumor classification system in 2011 that characterizes lung adenocarcinomas as a mixture of five subtypes based on histology (how cancer cells look under a microscope). To help determine prognosis, pathologists now report the proportions of the five subtypes within the tumor — including the predominant subtype, which makes up the highest proportion of tumor tissue — as well as tumor size. A low-dose chest CT scan of a patient with solid predominant subtype of lung adenocarcinoma. The new classification system has already begun to change the management of lung adenocarcinomas. In 2013, Dr. Adusumilli, working with MSK pathologist William Travis, showed that a subtype called micropapillary (MIP) morphology was more likely to recur after a limited operation known as wedge resection, in which the tumor and only a small amount of surrounding tissue are removed. This high rate of recurrence held true even for MIP tumors smaller than 2 centimeters. However, the recurrence rate was lower if the patient had undergone a more extensive procedure called lobectomy, which removes the tumor along with up to a third of the lung. This discovery has helped guide doctors in deciding how much of the lung must be removed to adequately reduce risk of MIP recurrence. In the new study, Dr. Adusumilli and colleagues investigated how various subtypes were related to recurrence in a larger group of patients. They looked at more than 1,000 stage I lung adenocarcinoma patients who had their tumors removed at MSK and who were followed afterward with CT scans for an average of five years. They found that the solid predominant subtype, which made up one in seven stage I tumors, was especially aggressive. Patients with this subtype had a 33 percent risk of recurrence over five years, compared with a risk of only 17 percent in the entire group. More importantly, solid predominant tumors usually recurred within two years, often at locations outside the chest area. The chance of recurrence was actually highest at the one-year mark. Patients with the solid predominant subtype were also more likely to die from their lung cancer more quickly after the cancer returned. Solid predominant tumors usually recurred within two years, often at locations outside the chest area. Dr. Adusumilli emphasizes the urgent need to identify these aggressive tumors well before operating. His laboratory, along with others at MSK, is already working on identifying several markers that can serve as early detection indicators. He also underscores the importance of surgeons working closely with pathologists to determine tumor subtype and choose the best course of treatment for the patient after the tumor is removed. “Even for these early-stage tumors, we need the kind of multidisciplinary approach that is possible at centers like ours that involves the highly developed expertise of our pathologists to help surgeons make the best treatment decisions,” he says. This research was supported by Grant No. LC110202 from the US Department of Defense. My very dear friend was diagnosed with Adenocarcinoma in 7areas including his back that he had to have surgery or chance not walking again ! I'm not understanding all of this. Can you please help me understand ? We’re sorry to hear about your friend’s diagnosis. Adenocarcinoma can originate in many different organs in the body, and then can spread to other locations. Without more detail about where your friend’s tumor originated, we are not able to provide information on how this cancer might be treated. We recommend you call the National Cancer Institute’s Cancer Information Service at 800-4CANCER if you’d like to discuss this with someone. Thank you for your comment. My husband was diagnosed this week with NSCAC that has spread to the adrenal gland. After CT, MRI and X-ray of everything from his brain to his pelvis, they find no tumor. Left adrenal glad is 4X normal size. Lots of cells in the pleural lining of the lung and a CEA of 16. How common is adenocarcenoma without a mass? Chris, we’re sorry to hear about your husband’s diagnosis. This is something you should discuss with his healthcare team. If you’d like to make an appointment at MSK, you can call 800-525-2225 or go to https://www.mskcc.org/experience/become-patient/appointment for more information. Thank you for your comment. Currently a pat. of Dr.M.D.Hellmann, MD I was a pat. of Dr. Seagals and MEDI 4736 clinical trial. NSC stage 4 in right lung, limp nod, and brain. It's gone It's all good Thank God and the DR. at you Hospital. HAVE BEEN REMOVED AT THAT TIME SO AM I RIGHT? Viola, we are unable to comment or speculate on individual cases. We are very sorry for the loss of your mother. What happens once the fluid is removed and it is not accumulating anymore. I am sure they take the drainage out, but what is next. My mother is thinking she is going to be cured but after going through my own cancer I do not believe that is the case. I am heartbroken as she seems not to have a clue that this is fatal, even though her doctor at Mt Sinai told her. I am a little confused as well why she wasn,t able to get surgery. I just read above that radiation does not affect the cancer. Please tell me what to expect and also are there any questions I should ask her doctor. I will be meeting for the first time in 2 weeks as I live distant to my mom. THanks in advance. Seth, thank you for reaching out. We suggest you speak with your mother’s physicians about these questions as we are unable to provide specific medical advice—every patient’s individual case is affected by a large number of factors. At Memorial Sloan Kettering, we provide emotional support and strength to deal with cancer, and we suggest you consult with her physician to find out about similar support (patient support, including counseling) that provide these benefits. I had a lobectomy of the right upper lung on Jan 11, 2016. Am still in the hospital & found you site extremely helpful in understanding all this. Before my surgery, I thought it would be a "walk in the park". The tumor was thought to be small, they would cut it out & happy days again. I was totally unprepared for the roller coaster that lied ahead. I had a PET scan before surgery & no other cancer was found. Now I was told it is adenocarcinoma and my type could have spread to the brain, a CT is ordered but then the agony of waiting for results. I hope we can talk about the Lord on this site because I prayed all night. It was all negative. Then we are told Chemo may be necessary to make sure it does not spread. After another day we find out the 5 year follow plan will be sufficient as it was stage 1B. I didn't mean to get so lengthly with this but was unprepared to know what questions to ask. My medical team is top notch but I suspect they thought I on top of it all when I had no questions to ask. Your sight has really explained the things I needed to know & I hope my comment helps someone who has just learned they have cancer. Thank you & Bless your Cancer Center and this site. Edwina, we’re very happy that our site has been helpful to you. Best wishes for you in your recovery, and thank you for your kind words. > malignant cells are strongly positive for TTF1 while negative for p63. > histologic features support poorly differentiated histology and a spindled component. I currently have two tumors both under 2 centimeters. What does the report really tell me ?? Dear Larry, we are sorry to hear about your diagnosis. It’s best to talk to your doctor to interpret the results of your pathology report and how it will impact your treatment options and prognosis. You may also be interested in checking out the American Society of Clinical Oncology (ASCO)’s website for patients, which offers some great patient education resources, including information about how to read your pathology report: http://www.cancer.net/navigating-cancer-care/diagnosing-cancer/reports-…. I have a 59yo patient diagnosed with primary adenoca lung Grade 4. He would like to come to SK Centre for assessment & treatment. Pls advise who the most appropriate specialist would be. We reside in Sydney, Asutralia. Dear Dr. Bakaric, our International Center can assist you in making arrangements for either a medical records review by mail or in making an appointment for your patient with the most appropriate specialist. Please contact them directly at international@mskcc.org or for more information go to https://www.mskcc.org/experience/become-patient/international-patients. Thank you for reaching out to us. My mother was diagnosed with adenocarcinoma in November 2015. She under went radiation and just recently found out that the cancer has grown. She now has two tumors and her doctors are unsure if the radiation was ever actually effective. She also has COPD and a pulmonary specialist has stated a loboectomy would likely reduce her lung capacity to drastically. Are there new treatment options or alternative options that she should look into for a course of treatment that would not drastically reduce her lung capacity or hinder her quality of life? Dear McKenzie, we’re sorry to hear that your mother is going through this. If you’d like to learn about treatment options for your mother at MSK, you can call our Physician Referral Service at 800-525-2225 or go to https://www.mskcc.org/experience/become-patient/appointment for more information on making an appointment. If your mother is not able to travel to New York, you may want to consult with a specialist at a comprehensive cancer center near you to find out whether treatments such as targeted therapies or immunotherapies may be appropriate for her. You can find a list of National Cancer Institute-designated cancer centers at https://www.cancer.gov/research/nci-role/cancer-centers . Thank you for your comment. We’re sorry to hear about your mother’s recent diagnosis. When cancer recurs years after treatment, it can appear in one or several parts of the body. It may not recur in the original location. But it’s also possible that this may be unrelated to her previous cancer. We recommend you discuss this more with her doctors after the biopsy has been performed. Thank you for your comment, and best wishes to you and your family. My brother in law has stage 4 lung cancer (adenocarcinoma). He has tumors in his back, lung, and adrenal glad. He has mets in his brain. He is currently getting radiation for the mets, and he has had 3 versions of chemo, the last is a trial called TAPUR ( chemo pill). We are waiting to hear if this is working. If not, can Sloan be an option for him?. Dear Lorre, we’re very sorry to hear about your brother-in-law’s diagnosis. If he is interested in coming to MSK for treatment or a second opinion, he can call 800-525-2225 or go to https://www.mskcc.org/experience/become-patient/appointment for more information. Thank you for your comment, and best wishes to you and your family. Dear Laura, we’re sorry to hear about your diagnosis. Because every patient is different, we are not able to answer questions like this on our blog. We recommend you discuss this with your healthcare team. If you would like to make an appointment at MSK for a consultation, you can call 800-525-2225 or go to https://www.mskcc.org/experience/become-patient/appointment for more information. Thank you for your comment, and best wishes to you. Could you please tell me if it is now understood that ground glass opacities are cancers? I am interested in the latest research into the composition of ggo's. Dear Susan, if you are interested in this research, we recommend you contact the Radiological Society of North America or the American College of Radiology. Thank you for your comment. A friend of mine was recently diagnosed with bronchogenic carcinoma, by a local hospital in Pennsylvania. She previously had cervical cancer within the last 2-years, as well as pre-cancerous fibroids/nodules on her thyroid and lymph nodes. What area/doctors should she try to see at Sloan for their opinion and confirmation of this diagnosis? Is this recent diagnosis, if correct, typically seen in those that previously had cervical cancer and fibriods and nodules. Thanks for your help. In reply to A friend of mine was… by John C.
Dear John, we’re sorry to hear about your friend’s diagnosis. If she would like to make an appointment for a consultation at one of MSK’s locations in New York or New Jersey, she can call 800-525-2225 or go to https://www.mskcc.org/experience/become-patient/appointment for more information on making an appointment. Thank you for your comment, and best wishes to you and your friend. Diagnosed with andenocarcinoma stage 2.Underwent surgery 6cm tumor removed all areas checked and clear.What are the chances of a recurrence. Dear Susan, we’re sorry to hear about your diagnosis but glad to hear your tumor was surgically removed. If you are interested in consulting with an expert at MSK about your risk of recurrence, you can call 800-525-2225 to schedule an appointment for a consultation. You can go to https://www.mskcc.org/experience/become-patient/appointment for more information or to request an appointment online. Thank you for your comment, and best wishes to you. Dear Adele, we’re sorry to hear you’re still having pain after your surgery. We recommend that you discuss this with your doctor. Thank you for your comment and best wishes to you. My friend was recently diagnosed with NSCLC stage 4. It's in both lungs with mets to the brain and C6-7. She was just started on a drug called Tagrisso. Would she benefit from a consultation at MSK? In reply to My friend was recently… by Wendy D.
Dear Wendy, we’re sorry to hear about your friend’s diagnosis. If she would like to come to MSK for a consultation, including to find out whether she may be eligible for a clinical trial, the number to call is 800-525-2225. She can go to https://www.mskcc.org/experience/become-patient/appointment for more information. Thank you for your comment and best wishes to you and your friend. My mother was diagnosed with grade 3 poorly differentiated Adenocarcinoma overseas, I live in NJ, and would like to know what is her treatment options? Dear Ghada, we’re sorry to hear about your mother’s diagnosis. If she is interested in coming to MSK for treatment or consulting with one of our doctors, you can email international@mskcc.org or go to https://www.mskcc.org/experience/become-patient/international-patients for more information. Thank you for your comment, and best wishes to you and your family.